Doulton artist profile – Robert Allen. A Robert Allen design carried out by his studio ca.1900. Robert Allen began work at Nile St. when it was still owned by Pinder Bourne, after a brief period at Minton’s as a boy worker. Robert flourished under the guidance of John Slater, then art director, eventually taking over a painting department of his own. Work from his department is denoted by his initials R.A. followed by a number. Robert Allen’s own signed work is however, rare. Yet, he and his department were entrusted with much of the finest and most expensive decoration carried out at Burslem notably for the great exhibitions at which Doulton exhibited from the late 19th century. Robert was notably involved in the early development of Titanian ware too although it is the work of his son Harry in Titanian that is typical. A group of miniatures bearing an RA number from the Robert Allen studio. Collecting Doulton seriesware – Sedan Chair. An unusual Sedan Chair seriesware survival – a Cheese dome. The bases often turn up and are described as bread and butter plates, but here is the full thing! Introduced in 1912 and withdrawn around 1940, examples are not frequently seen suggesting production was much shorter. The art nouveau shape is incongruous to the seriesware pattern but the series is so charming that one doesn’t notice. The scene illustrated is No.2 hitherto not illustrated. Seriesware never fails to surprise us even today! One of our collectors recently asked about the jardinière pictured. It bears a simple, impressed ‘Doulton’ mark that often throws collectors but this method of impressing the Doulton name can be found still in use into the 20th Century too, although later examples are accompanied by the usual lion and crown Doulton mark. Returning to the pattern of the jardinière, I term it a transitional pattern from the period when Doulton entered into partnership with the Pinder Bourne factory owner in 1877 and the time when Doulton eventually took over the Nile St. enterprise entirely in 1884. In the aesthetic taste, it is certainly of this period and I have seen plates marked Pinder Bourne but also further examples simply bearing the Doulton brand. Here is a tureen marked thus. We would love to hear from other collectors who have examples of this design to compare backstamps. 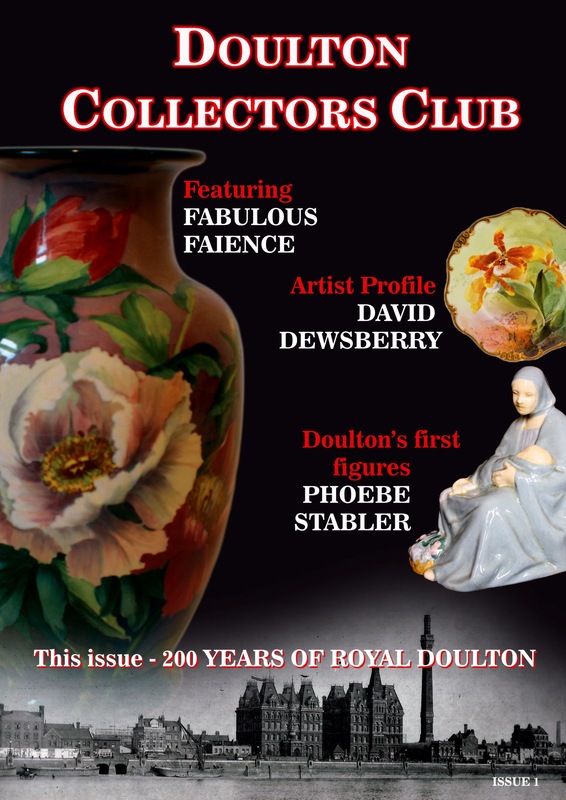 Don’t forget that if you’re interested in Doulton join our facebook page and also visit http://www.paulwebsterantiques.co.uk where you can also subscribe to the brand new Doulton Collectors Club magazine! Isse 1 is out now! Built in the 1870’s in the gothic style ‘A’ and ‘B’ blocks as they were known and the huge chimeney that stood next to them were a London landmark for 75 years and witnessed many of Doulton’s major accomplishments as well as playing host to many famous visitors from Royalty, to politicians, to latter day celebrities. Doulton vacated these impressive buildings in early 1940, moving to the newly erected Doulton House, then just a few hundred yards along the Albert Embankment. Lying unoccupied and suffering bomb damage during WWII there was little option left than to demolish these impressive buildings in 1951. A drawing of the Albert Embankment by Arthur Pearce showing the extent of the Doulton works in 1924. Note the corner building that still stands today.